This past weekend I visited Bristol (yep, I really liked it!) and there was a public art exhibition called Gromit Unleashed. Are you familiar with Wallace and Gromit? 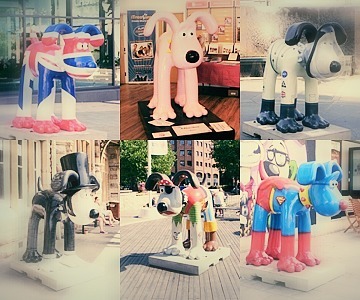 Well, 80 giant fibreglass sculptures of Gromit (5ft tall), each designed by different artists, were (and still are for the whole summer) all over the streets of Bristol and the surrounding area. It goes without saying that children and adults were both having great fun taking pictures with those sculptures! Of course, even me :P and yes, I wish I could have designed one as well! Here on the left you can see a little collage I made with just a few statues I photographed.